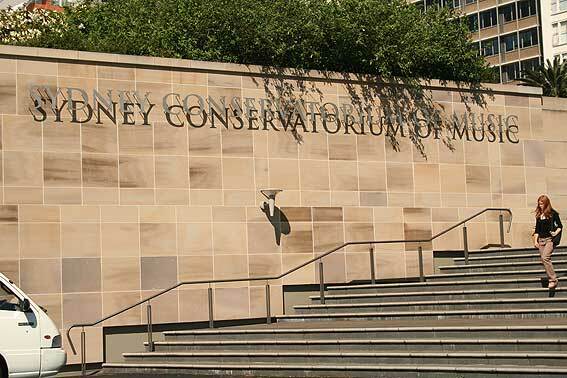 Established in 1916 and housed in the former stables erected for Governor Macquarie, with some departments in recent years having to be located at other sites, the “Con” has now been given a wonderful regeneration in restored and enlarged premises alongside Sydney's Royal Botanic Gardens. Restoration began in 1998 and concluded in August 2001. Facilities now include the main Verbrugghen Concert Hall (named after the first Director) housing the restored Pogson organ and seating 550, a flexible music workshop seating 250, twin recital halls accommodating up to 150, administrative wing, rooms for some 200 academic staff, in excess of 130 practice studios, library, café and Conservatorium High School. Advanced engineering has virtually eliminated sound and vibration from the city underground railway by the use of springs and rubber pads. Entrance is no longer through the Greenway building but via a very impressive foyer and atrium in the additions to the south, much of which is underground. The Verbrugghen Hall no longer has a proscenium stage but a vast open podium for choir and orchestra in front of the organ. There is still a rear gallery but it is connected to the stage by side galleries which also have seating. Side walls have an unusual acoustic device which comprises a number of blinds that can be raised and lowered by computers according to the needs of particular performances. The colour scheme is restful with lots of light wood, port-wine upholstery and grey to white walls. 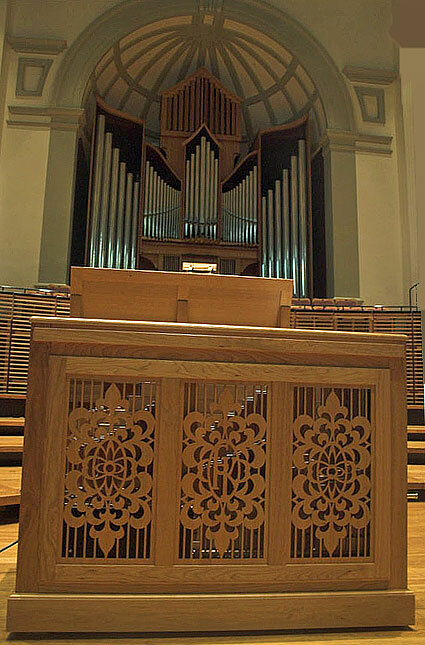 The organ dominates the whole as it stands commandingly in its half-dome niche, and without the Ruckpositiv in sight; previously that sat in front, but has now been relocated behind the console. The organ now stands about 600 mm forward from its original position and about 600 mm higher. Editor Geoff Bock and I had the pleasure of inspecting the building on Friday 5 October in the company of keyboard lecturer Philip Swanton, who noticed that quite by chance, both Geoff and I wore shirts matching the port-wine hue of the main hall. We were also pleased to meet John Hargraves and his wife Val, organ builders of South Island Organ Co Ltd, which has more than successfully carried out the instrument's rebuild. Philip demonstrated the 37 stops over three manuals and pedal to our satisfaction, Geoff commenting that he could not believe the result considering the original installation was so different. The hall was filled with glorious sounds from solos to tutti but we were informed that, because of the improved acoustics favouring all instruments, a large orchestra drowns the organ. Yet all lovers of the King should look forward in anticipation to public demonstrations of this excellent installation in 2002 - the organ was not included in official ceremonies in August as it was not expected to be ready. Afterwards we were treated to a view of the tracker workings in a chamber below the instrument. Fine stainless steel encased in nylon is used in the trackers of this completely new action, the tension of which is automatically adjusted. A unique feature is the use of mass loaded Schwimmer regulators. The co-operation of various government departments, acoustic consultants, the Con itself and the Royal Botanic Gardens have given us a music education facility equal to anything in the world. Go and see for yourself. 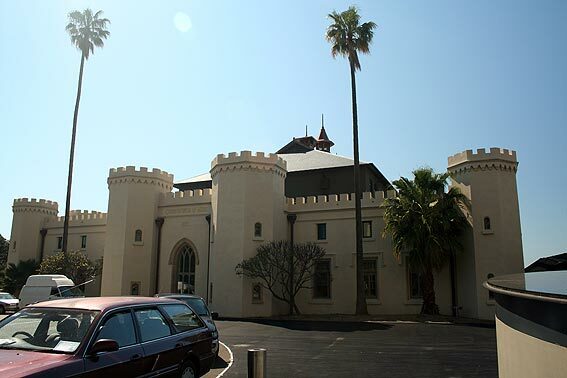 Older readers will probably remember the Sydney Conservatorium as I do - a ramshackle rabbit warren with its central structure still bravely gracious in spite of the addition of unsympathetic outbuildings, sheds and extraneous additions. The overall impression was one of general neglect and cheap, short-term expediency trying, unsuccessfully, to redress the shortcomings inherent in a building that could no longer effectively fulfil its role. That it functioned at all was only because of the dedication and patience of both staff and students. Cost overruns on the new project, mostly unforeseen and unavoidable, called forth the customary braying of the tabloid media about wastage of public money and delusions of grandeur on the part of the elite minority. The favourite phrases of “callous indifference” and “wanton disregard” were tossed around by headline writers and callback radio know-alls. Of course had the facility been another sports stadium or gambling casino little of substance would have been said. It is to the everlasting credit of the authorities and those directly concerned that in spite of criticism and public disinterest the project continued and was duly completed. And with such an outstanding result. Sydney is fortunate to be home for a number of superb historic organs. 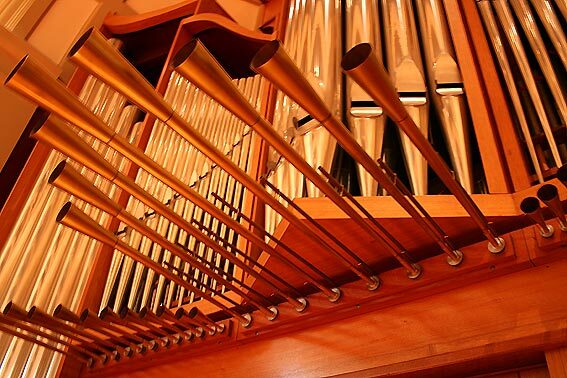 It is also home to some modern instruments that are among the first ranks of the organ builder's art. The von Beckerath at the Great Hall in the University of Sydney comes to mind, as does the Létourneau at St Mary's Cathedral and the Sharp at Knox Grammar School, amongst others. The rejuvenated Conservatorium organ now joins these notable instruments and will be a worthy asset to the splendid facility which is its new home. 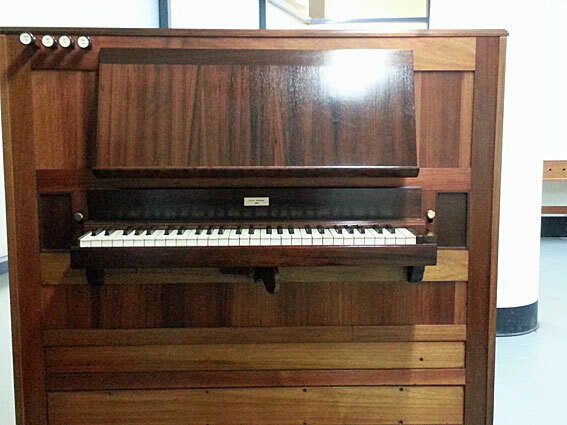 South Island Organ Co Ltd has just finished rebuilding the Sydney Conservatorium 1973 Pogson organ of 3 manuals and 37 speaking stops in the refurbished Verbrugghen Hall. 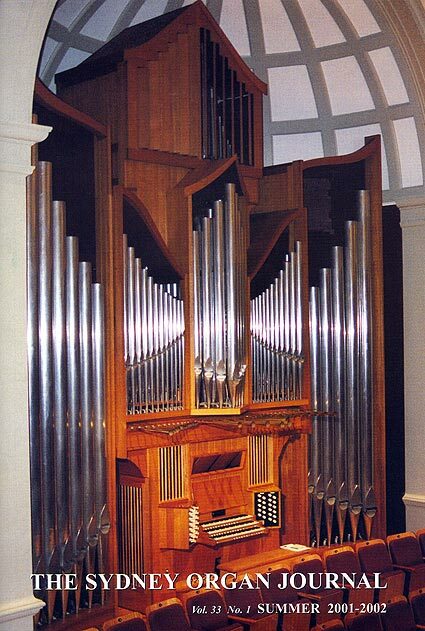 Features of the organ are the new pre-tensioned mechanical key-action and flexible wind-pressure regulation systems designed by Lynn Kirkham of UWA in Perth. The new piston capture system designed by Muldersoft Organ Systems of Auckland features 112 memory levels divided into 7 user areas, each with pin-number access and 1535-step sequencer divided into 16 ''items'' of 96 steps. The former Ruck-Positive division has been reconfigured behind the console as a Brustwerk-Positive to suit the new orchestral/choral stage plan. Very few changes have been made to the original specification although the voicing has been made warmer. The stop changes are on the Swell division, which has been modified by reconstituting the Mixture with an additional 4th rank and lowered pitch. A new Celeste has been substituted for the former Tertian Mixture and the 4' Spitzflute has been transposed to 2' and the 2' Principal to 4'. The organ has been brought forward 600mm and raised up 600mm on a new floor in its former quarter-dome niche position and is a striking feature of the room. The hall has been transformed into a wonderful concert room with beautiful acoustics and comfortable seating for 550 persons with a stage designed to accommodate a full symphony orchestra and choir. The consultants were David Rumsey and Robert Ampt. Designers of the new organ were SIOC's John and Ian Hargraves and the voicer was John Gray. 6 toe pistons to Pedal. Switch for Great and Pedal Pistons coupled. Switch for Generals on toe pistons. Next, Last, Restore. sequencer pistons. Although the Pogson organ was in a sad state of repair when we dismantled it, we had no doubt that it had the potential to be an excellent instrument for much less cost than a totally new organ. It had suffered massive damage from moth infestation, from resin bleeding timber, from leather and rubbercloth rotting, from some minor design errors, heavy usage and lack of maintenance. The key-action was very worn, unresponsive and heavy. The electric stop-action was very unreliable and noisy. The pipes were choked with dust and the sound locked up in the operatic curtains. However the organ was well planned and built of high quality materials in its essentials. I believe that the high quality of the finished result has more than justified our faith in rebuilding the Pogson organ, which is now a pleasure to play and listen to. 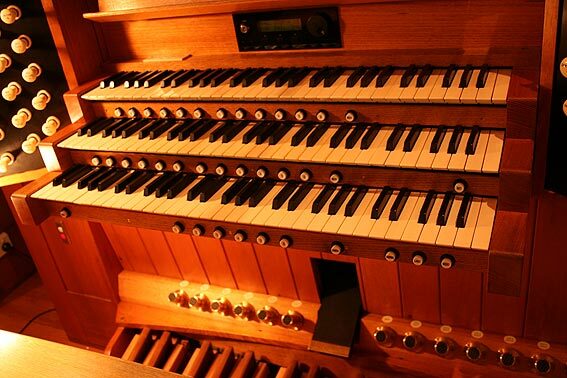 Robert Ampt: writes: When, in June 1999, I was asked by the Sydney Conservatorium to act as its Organ Consultant for the Verbrugghen Hall Pogson organ rebuild two significant decisions had already been made. 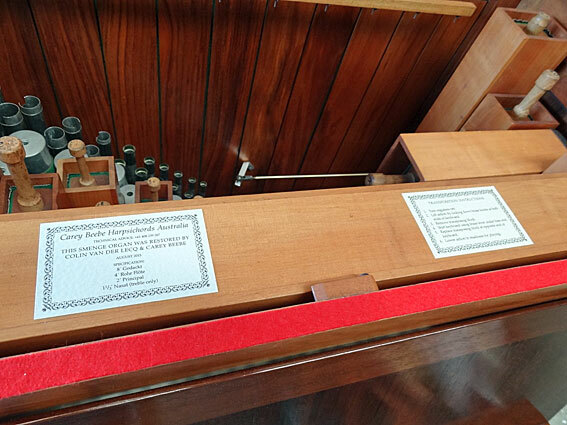 The first was that the Ruckpositive was to be repositioned inside the main case, and the second was that the work was to be undertaken by the South Island Organ Company of New Zealand. The contract brief also covered other aspects including the playing action and the replacement of some pipes. Apart from the repositioning of the Ruckpositive there was no change to the actual stop list. 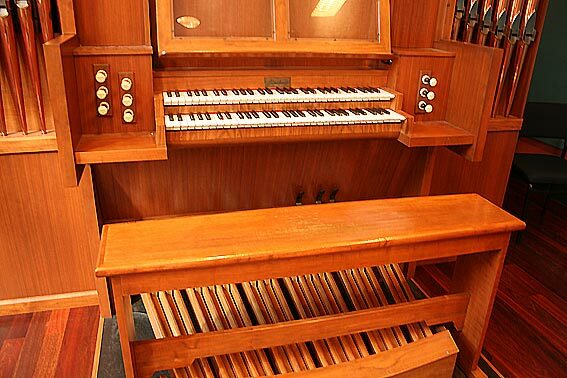 My first contact with the organ had been in 1978 when I used it as a teaching instrument. Although the organ was solidly constructed and the basic stop lists reasonably satisfactory, the action was rather heavy and the voicing in need of some adjustment (subsequently carried out by Létourneau in the 1980s). Whatever the state of the organ, it had to do battle with the acoustic of the hall; an acoustic that was simply frightful, being completely dry and lifeless. Although by 1999 the organ had been silent for some years - many of the stop sliders had become jammed - I felt that it should be saved and rejuvenated. I also felt that the opportunity existed, through this project, to enhance the instrument significantly, but relatively inexpensively. To this end I spent several exciting hours with John Hargraves of the SIOC redesigning aspects of the specification to give the organ extra flair, colour and expressiveness. The resulting Consultant's Report took a much more positive view of the organ and of the opportunities presented by the refurbishment project than was probably thought possible from a Sydney organist. Instead of looking for ways to simply keep the organ going, the Report enthusiastically outlined a scheme to, not only give the instrument new life, but also to give the Conservatorium and the city a 'new' and worthy instrument. At this point the story can best be continued by simply quoting sections of the Consultant's Report: VERBRUGGHEN HALL . SYDNEY CONSERVATORIUM OF MUSIC ORGAN REBUILD. (Quoting from Consultant's Report). The revised specification presented below, worked out together with John Hargraves of the South Island Organ Company, aims to resurrect and refurbish the Pogson organ so that it will become a fit and fitting organ for the main concert hall of the Sydney Conservatorium of Music. The relocation of the Ruckpositive division, which has forced tonal changes to the organ, was seen as the opportunity to reconfigure and considerably improve the organ's tonal scheme. It has been deemed necessary to both change stops and add stops to the organ. The proposed scheme, although only five stops larger than the old instrument, will see an organ of considerably greater colour, versatility and usefulness. Almost all of the old organ will be reused or recycled in the new scheme. To bring the organ to concert standard and to accommodate the relocated Ruckpositive division, it has been necessary to re-evaluate the complete tonal scheme as follows. A. The relocation of the Ruckpositive into the “Brust” position will change the complete dynamic of the overall design. Whereas the Ruckpositive was the secondary chorus division in the old scheme, it will become a more intimate division after the relocation, with the secondary chorus role needing to be transferred to the Swell division. This will necessitate changes to the tonal and dynamic resources on those two divisions. B. Both because of these changes, and also because of the need to correct some major deficiencies in the old tonal scheme, a small number of stops has been added, increasing the number from 37 to 42. These changes will not only increase the organ's teaching capabilities but will also increase its colourfulness and ensure its ability to perform satisfactorily in virtually all anticipated performance situations. B. Positive. In keeping with the new, more intimate character, add additional 8' stop - Quintadena 8' and remove Scharff lV. If possible, add swell shutters hidden behind open grilles and a corresponding swell pedal. C. Swell. Replace Cymbel and Terzian with a more powerful and more appropriate mixture based on reworked pipes from the old Ruckpositive Scharff, Pedal Mixture and Swell Terzian II. The new mixture possibly to be divided into parts - high pitches and l pitches, depending on the soundboard layout. To better define the true character of the rather pallid Swell, add an Open Diapason 8', a Celeste 8', a 4' flute of ''harmonic'' construction, and a soft 8' reed - Oboe 8'. D. Pedal. Generally impart greater weight and warmth by removing the largely redundant Kornett 2 and Mixture, and adding a quiet 8' flute and a 32' reed, and possibly also a string stop - Cello 8' or a resultant stop - Quint 10-2/3', this last depending on the results of final design drawings. Given the considerable weight of the present two 16' manual stops, the proposed 32' reed, and possibly also the Quint 10-2/3', become necessary for the proper balance of the instrument. The Report noted that the proposed changes/additions would be relatively inexpensive, costing only about half the amount compared to implementing them later, and would produce an instrument worth more than twice the total cost of the refurbishment. The Conservatorium decided not to implement the recommendation so that, with the exception of relatively small changes to the Swell, the stop list has remained unchanged. Many will consider it a major opportunity for improvement now lost forever. Even with these limitations, the South Island Organ Company has achieved a splendid result with the organ. The sound is bright and blended, and seems quite strong in the hall. Very importantly, the rebuilt Verbrugghen Hall (which now, perhaps sadly, bears little resemblance to the original heritage building) offers a very live and sympathetic acoustic. In fact it is so “bright'' that the proposed 8' and 32' stops might well be missed. The new playing action (which is somewhat spoiled by the budget-required retention of the original coupling action) is very fine. The old stop motors (again retained because of budget restrictions) can still be heard squeaking from the console although not from the hall. It was a shame that the instrument was not to become one of Sydney's few organs with a 32' Pedal reed, or Sydney's first organ with a horizontal Trumpet. Concert and teaching possibilities were certainly sacrificed. 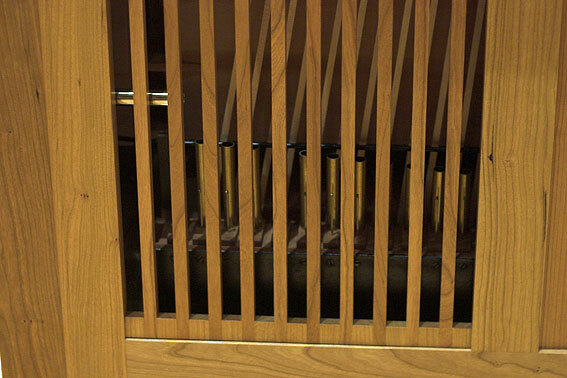 And the power of the full organ has also suffered as a result of the missing horizontal and 32' reeds, for although the organ seems loud enough when played alone, it is inadequate with an orchestra simply because the now rather 'loud' acoustic of the room also boosts the orchestral sound. 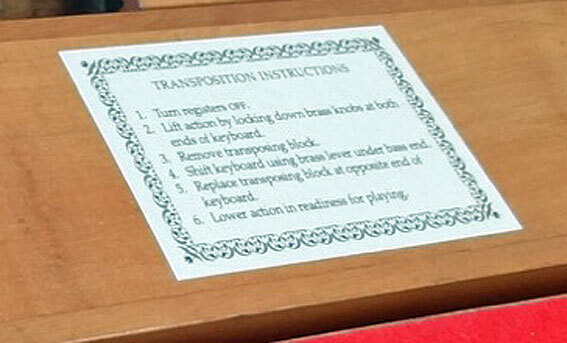 Even with these perhaps disappointing limitations the Verbugghen Hall organ is now a useful and successful instrument which, happily, is still able to speak with a certain Pogson accent. 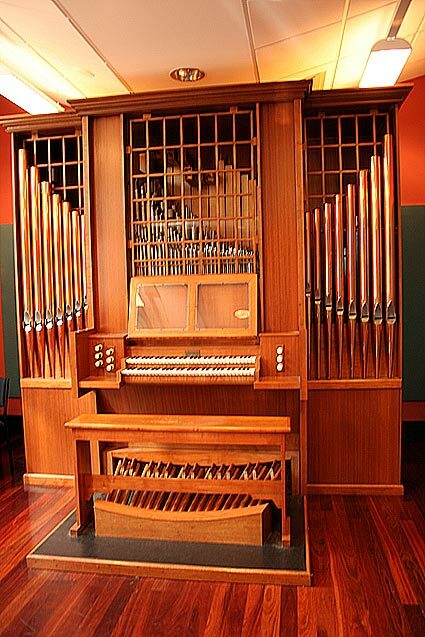 As a very impressionable, second year organ student at Sydney Conservatorium of Music in 1973, I well recall the excitement of first playing on the new Pogson organ - and drinking a celebratory pipeful of champagne with the organbuilders (from a hastily requisitioned Ruckpositiv Principal 4' pipe) in the middle of the Verbrugghen Hall stage! Tastes change with time (especially with regard to beverages)! My own particular musical interests post-Sydney Conservatorium led me around the world and onto some of the world's finest instruments, both new and old. Living for 16 years just an hour's drive away from the world famous Swiss organ building firm of Metzler meant that I was in the enviable position of having access to a whole range of instruments of unparalleled tonal and mechanical perfection, the likes of which - even in the year 2001 - have unfortunately yet to be heard and experienced in Australia. Thus my own personal preference for the Verbrugghen Hall project would have been for the construction of an entirely new instrument of this sort of calibre, i.e. an organ of uncompromising musical integrity and technical excellence. 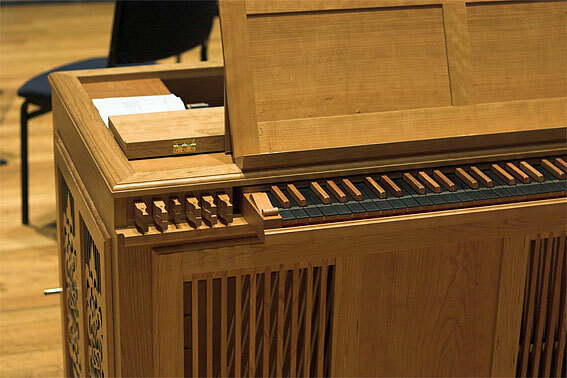 Such an instrument would not only have offered students of organ a far more stimulating and rewarding vehicle for their musical endeavour than the rebuilt Pogson, but would also have exerted a significant drawcard effect at both national and international levels - in much the same way as the new Conservatorium building itself is doing. The original consultant for the organ rebuild (and my predecessor in the Organ Studies Unit), David Rumsey, fought long and hard for a solution of this kind. Unfortunately our vision stood little chance of acceptance in the face of the financial constraints imposed on the project by the State Government. 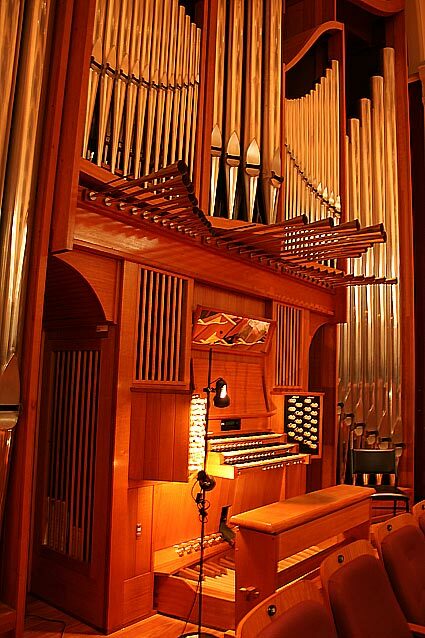 With the benefit of hindsight and in view of the total final outlay for the Conservatorium renovation, the provision of an organ of this quality would not have accounted for a hugely disproportionate amount of total expenditure). What we have now ended up with is therefore, once again, something of a compromise - both from a musical and an organ building perspective. Nevertheless in rebuilding the original Pogson organ, the South Island Organ Company (SIOC) has, in spite of these constraints, succeeded in providing the Conservatorium with a very well-regulated instrument of considerably enhanced tonal quality, and one which can also be expected to function with greater mechanical reliability over the course of time than did the original organ. SIOC's commitment to the task of resurrecting this instrument has been most commendable. The quality of workmanship would appear to be of the highest standard in all areas and their attention to detail has been painstaking. The decision to relocate the old Ruckpositiv division to a new position (as an “Echo-positiv'') immediately behind the console was the most intrusive and potentially most destabilising aspect of the whole project, both in terms of its impact on the overall tonal design of the instrument and the major reconstruction of the mechanical action which this transposition would necessitate. However it would appear that this was, indeed, a very intelligent move; the changed layout of divisions has been very successful. By making some small (but signifcant) alterations to the specification and voicing of the Swell (viz. the addition of a Voix celeste 8' and an extra rank in the Mixture; the conversion of the Principal 2' to a 4' rank and the Flute 4' to a 2'), a secondary chorus division has been created which now fulfils this rôle with greater tonal strength and flexibility than would have been possible, had the original layout been retained. At the same time the organ now has a third division (“Positiv''), which offers the player a range of delightful registration possibilities that are ideal for use in more intimate solo or chamber works, or where special “echo” effects are called for. Mention has already been made elsewhere of the much improved Verbrugghen Hall acoustics. We are indeed fortunate that the acoustical responsiveness of this stunning performance space (now certainly one of the best concert venues in Sydney!) has turned out so favourably - particularly at the lower end of the frequency spectrum. Nevertheless a detailed examination of the individual organ stops also reveals a consistency in voicing and an evenness of dynamic development throughout the entire compass for which SIOC - and in particular their voicer, John Gray - must also be given credit. The relative strengths of individual stops, as well as the manual and pedal divisions themselves, have been very carefully judged and balanced. One of the more immediate challenges our students are facing is learning how to adapt their playing (tempi, articulation etc) to these enhanced acoustical surroundings, after having become somewhat accustomed to the very dry acoustics (and rather uninspiring Schuke instrument) of the German Lutheran Church in Goulburn Street, Sydney. SIOC has put a great deal of time and effort into providing the organ with an improved wind supply system, replacing the old sprung Schwimmers with mass loaded regulators. As a result the pipes now breathe with almost vocal flexibility, where previously there had been virtually an industrial rigidity to the sound. The way in which the wind system responds to a given style of playing will depend to a certain extent on such factors as thickness of texture, registration, tempo, speed of repetition of notes/chords, etc. Under certain circumstances the sound can develop a slight “shakiness” (actually a sympathetic resonance in the wind system). A skilled player (and alert listener) can easily prevent this “problem” arising in the first place by adapting his/her own playing appropriately. Herein lies a further learning challenge for our students. 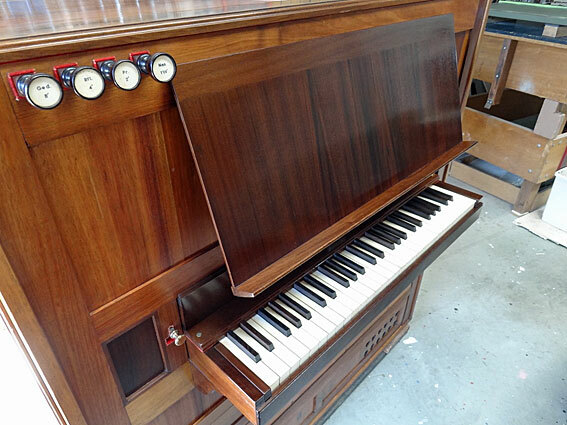 Compared with the original organ, the action of the rebuilt instrument has been significantly improved. The old wooden trackers have been replaced with pre-tensioned, self-regulating stranded wire trackers throughout, which automatically make allowance for seasonal variations in the mechanism. The manual action is precise and well adjusted, although coupled manuals (especially Sw/Pos) are a little heavy. Since completion of the project on August 16 the tuning stability of the organ has been remarkably good. John Hargraves returned briefly in early October to attend to a few matters and found all 8 reeds still in just as good a state of tuning as he had left them. The temperature and humidity control systems installed in Verbrugghen Hall would appear to be functioning extremely well, which clearly will enhance the stability and therewith the life expectancy of the instrument. One would indeed hope that the rebuilt organ will now serve the Conservatorium's needs somewhat longer than the 15 or so years that the Pogson lasted. (It is, of course, very poor use of resources to rebuild a pipe organ even 25 years!). And certainly in view of the excellent work carried out by SIOC, there is every reason to believe that it will. And the future? For well over a decade now Sydney Conservatorium has been without its own concert-standard pipe organ. Organ teaching, practice and student recitals have taken place at a variety of outside venues. The Organ Studies Unit has, as a result, had little real 'presence' within the institution (out of sight = out of mind!) which, in turn, has led to some unjustified negative perceptions both within the Conservatorium walls and in the wider musical community about our “state of health”. Over the same period of time we have seen a marked decease in enrolment for organ studies. Whilst this trend is not unique to our institution or city, the lack of a viable teaching and concert instrument has undoubtedly been a contributing factor to this situation. With the rebuilding of the Verbrugghen Hall organ the Conservatorium now has at its disposal a vastly improved instrument which accommodates a broad range of repertoire most convincingly. 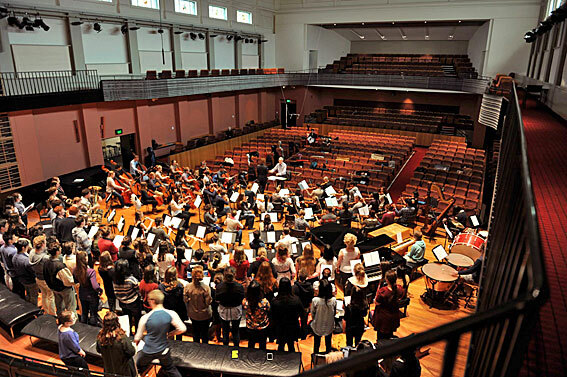 Preliminary enrolments for 2002 are already up on past years; it is to be hoped that the new Conservatorium facility will now encourage even more students to consider studying the organ at “the Con”. A weekend of events specifically designed to showcase the newly completed instrument and to celebrate its reopening will take place early in the new year. In addition the organ will feature regularly in the Conservatorium's concert calendar in a variety of capacities from March 2002 onwards. 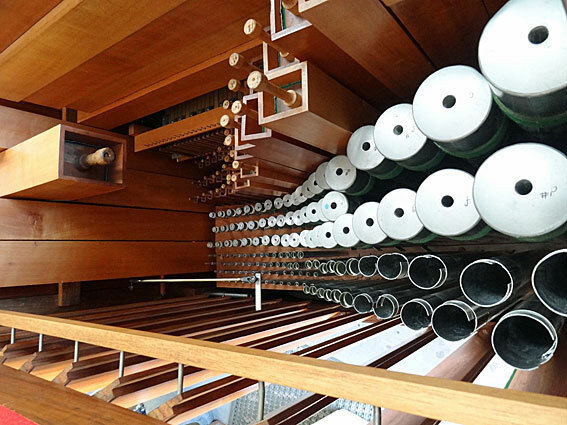 In early March 2009, the Conservatorium took delivery of the chamber organ from the baroque keyboard specialist Henk Klop of Garderen, Netherlands. Klop generally builds approximately 10 organs of various sizes every year for usage in various capacities around the world. 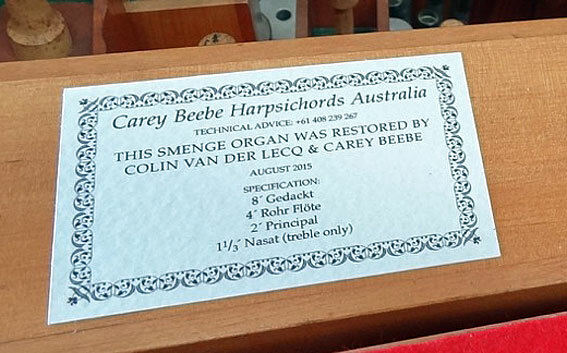 Australia itself now has three chamber organs built by the Klop firm (the other two Klop organs being at the Melbourne Recital Centre  and at the harpsichord factory of Carey Beebe in Peakhurst, Sydney ). 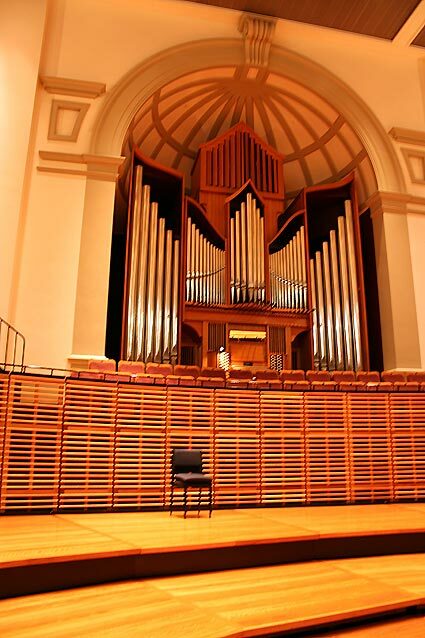 The arrival of the Klop chamber organ has been eagerly awaited by the staff and students of the Con as it would be in heavy usage in both rehearsal and recitals with the various ensembles of the Conservatorium or in a solo capacity. 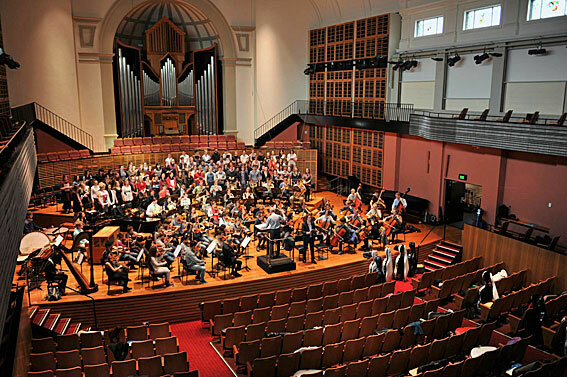 In the past, the Con needed to hire the various chamber organs as required from around Sydney which has proven to be quite an expensive exercise. As a result, Dr. Neal Peres da Costa (Chair, Early Music) found it prudent for the Conservatorium to invest in its own chamber organ. 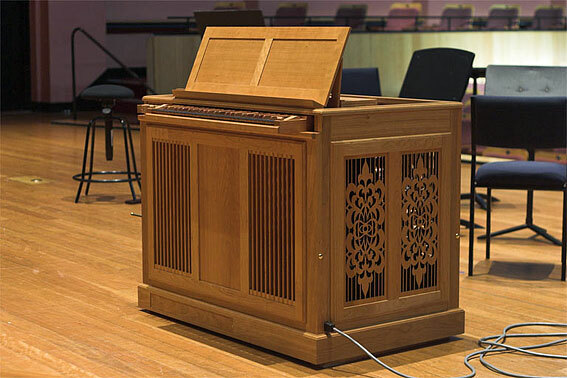 With the input of Dr. Alan Maddox (Lecturer, Musicology) and Philip Swanton (Co-ordinator, Organ Studies), the specification of the chamber organ is very comprehensive, creating an instrument that is versatile as both an ensemble and solo instrument. With all ranks divided at c/c# it is possible to have two contrasting registrations on the same manual, thereby enhancing the possibilities of the instrument. The pipework of the flue stops are all of wood while the Regal is of brass construction. 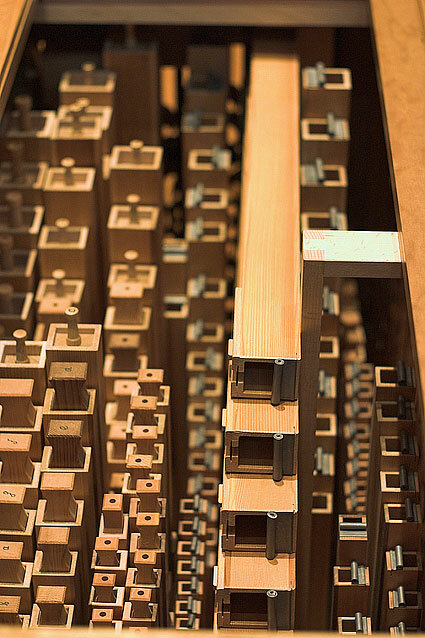 Knud Smenge built a chamber organ for the music department of the University of Sydney for continuo use. The whole instrument is enclosed in a box-shaped case of Tasmanian Blackwood with knee-controlled swell shutters operating on the front. The manual compass is 54 notes and there is a transposing movement.